Human Tim + Robot Tim will be playing Beat Kitchen March 6th and ChiIL Mama will be posting a video interview, stills, and live footage from their Schubas show last month. We also have a family 4 pack of tickets for 1 lucky winner. Enter at the bottom of this post for all ticket give aways through mid March. *We'll also be giving away 3 of their Pop of the Tots! CDs on upcoming Win A Disc Wednesdays starting with the first one in March. Enter for all monthly CD give aways on our Win A Disc Wednesday form. How Far To Austin, an adult but family friendly, rock/pop/soul band, featuring Chicago parents Tate and Katie Troelstrup, have offered our readers a great give away. 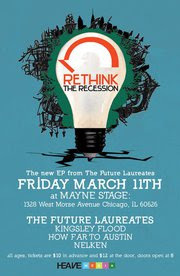 *We have 2 pairs of tickets to their show on 3/11/11 AND 4 signed CDs for all winners. Enter below for your chance to win and/or click HERE to purchase tixs. 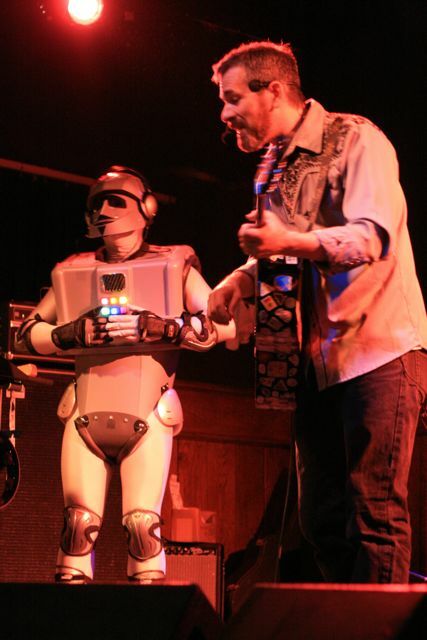 Tate says: The show is all ages, and we are supporting our friends (and fellow CHICAGO ROOTS COLLECTIVE artist) The Future Laureates for the release of their new e.p. Mayne Stage is an absolutely incredible venue, and we're very excited to be playing at 9:00 p.m. so that our younger fans can get out and see the show! Little Miss Ann and Candy Band are on a double bill at Beat Kitchen, Sunday March 13th. We'll be posting interviews, live footage and lots of pixs of both bands, leading up to the show. Enter below for your chance at 4 free tickets. *In conjunction with the show, we have a 3 CD special for one lucky winner--Candy Band's latest release-High Five plus Little Miss Anne's Clap for Love AND Music for Tots. This week, we'll also be reviewing a brand new, March 1st DVD release, by Gustafer Yellowgold, one of our all time favorites. 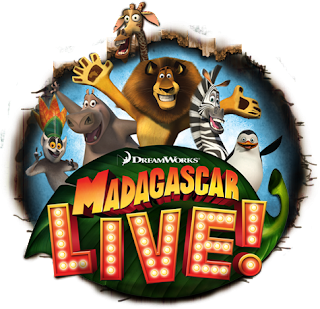 Dreamworks Madagascar Live! is coming to Rosemont Theatre starting March 16th, and you can still enter to win a family 4 pack of FREE tickets to opening night right here! We'll have a full review after the show, but we've got a sneak peek, photos and fun facts coming up this week. Enter for any or all 5. You can keep sharing on FB, Twitter and other social media and entering here, for your chance to win 4 tickets to any or all of the shows, through the posted end dates. Good luck! ChiIL Mama has Free Family 4 Packs of Tickets to all Beat Kitchens Concerts for Kids through the first half of March and for entries for a family 4 pack to Dreamworks Madagascar LIVE! at Rosemont Theatre's opening night, 3/16. And...1 super special, numbered and signed poster of Gustafer Yellowgold.